Nearly two weeks since Jamal Khashoggi vanished in Istanbul, the shadow of the Saudi journalist’s disappearance continues to loom ever larger. Now, President Trump is threatening “severe punishment” for Saudi Arabia if suspicions of Khashoggi’s murder are confirmed — and Saudis have vowed to retaliate in kind. The comments Sunday follow Trump’s toughest comments yet about the simmering international controversy. Speaking with CBS’s 60 Minutes, the president said that “nobody knows yet” whether the Saudi government ordered the killing of Khashoggi, a frequent critic, as Turkish officials reportedly allege. Still, he was careful to hedge his language — as he has been largely since Khashoggi vanished after the journalist’s visit to the Saudi consulate in Istanbul. His administration has been on friendly terms with the Gulf regional power since taking office, supporting the Saudi-led airstrike campaign in Yemen and brokering an arms deal that could be worth $110 billion over the next decade. During a news conference in the Oval Office on Saturday, Trump responded to a question about his response to the Khashoggi controversy by touting the economic benefits of the weapons sale. Nevertheless, the Saudi Stock Exchange plummeted about 7 percent at one point Sunday on fears of economic fallout from the diplomatic dispute, before recovering some of its losses later in the day. So far, administration officials have also expressed reluctance to canceling participation in Saudi Arabia’s signature economic forum, the Future Investment Initiative. A wide array of global business leaders — including World Bank President Jim Yong Kim and Virgin founder Richard Branson — has pulled out of the conference later the month. At the moment Treasury Secretary Steven Mnuchin plans to keep his own plans to attend — though Secretary of State Mike Pompeo says they’re evaluating the situation closely. U.S. lawmakers, for their part, have come out more strongly. A bipartisan group of nearly two dozen senators have called for an investigation into Khashoggi’s disappearance, and some have suggested they would be willing to block the Saudi arms deal if more damaging details come to light. And Rubio said that no U.S. government officials should be attending the Saudi conference until they get some official answers about what happened. European leaders followed in demanding answers from the Saudi government, in a joint statement on Sunday. Three foreign ministers from the U.K., France and Germany called for “a credible investigation to establish the truth about what happened [to Khashoggi],” and for those responsible for his disappearance to be held accountable. 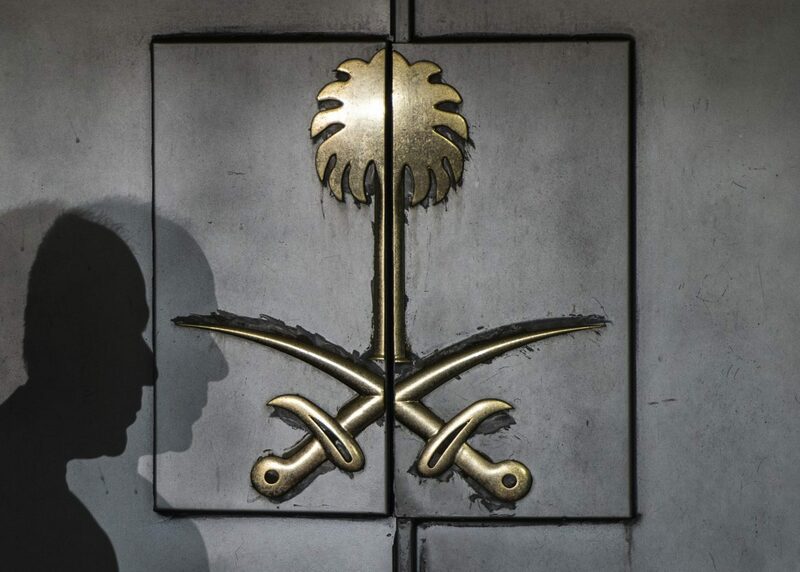 “We encourage joint Saudi-Turkish efforts in that regard, and expect the Saudi Government to provide a complete and detailed response,” said British Foreign Secretary Jeremy Hunt, French Foreign Minister Jean-Yves Le Drian and German Foreign Minister Heiko Maas — a message they said they issued directly to Saudi officials. NPR’s Emma Bowman contributed to this story.